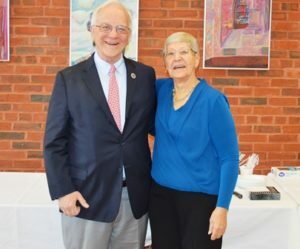 Southborough – The Rotary Club of Southborough presented its annual recognition of service award April 7 to Barbara Jandrue and Christopher Robbins in a ceremony held at St. Mark’s School Taft Hall. 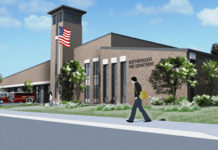 Each year “Celebrating Service, Celebrating Southborough” event is organized by the club to recognize people in Southborough who have provided outstanding service to the town. Barbara Jandrue was honored for her dedication and unflagging efforts at the Southborough Food Pantry over several years. 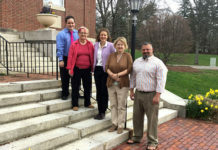 Founded in 1990, the Pantry serves Southborough residents and parishioners of the five member churches of Pilgrim Church, St. Matthew Church, St. Anne Church, St. Mark’s Episcopal Church and First Community Church. Jandrue has worked for years to raise awareness around food insecurity, continuously solicit food items to keep the Pantry stocked, and built an engaged volunteer network. The second honoree was long time Rotary club member, and military veteran, Chris Robbins, for his support of veterans and the Southborough community for many years. Robbins served in the U.S. Army for 21 years: three years on active duty, and 18 in the Army Reserves. He served four years as president of The Armed Forces Committee of Worcester County, a nonprofit that exists to honor and support area veterans. He always gives willingly of his time and expertise, helping organizations make the greatest possible impact. He is on the board of the Alliance Health and Human Services, a nonprofit that runs nursing homes, and foster care program, and also on the board of the Southborough Economic Development Committee. Past recipients of the Rotary club’s service recognition award include Karen Fournier, Jeff Beane, Doreen Ferguson and John Wilson. Rotary focuses on providing “Service Above Self”. “As a local service organization, we want to recognize good people doing good work,” said David Vachris, Rotary Club past-president 2017-18. For more information visit southboroughrotary.wordpress.com.